What might happen to a vehicle when its wheels get locked? The vehicle will lose its steering ability. The vehicle will lose its braking ability. The steering ability is not influenced. What will be the result of moderate driving, without performing heavy engine accelerations? Savings in the vehicle’s electricity consumption. Driving becomes longer than necessary. The size that was determined by the vehicle’s manufacturer. The size recommended by the tire professional in the garage (the tire repairman). The size that was determined by the tire manufacturer. The size that appears to be most suitable for the vehicle. Step on the brake pedal and on the accelerator. Press on the starter switch. What are you required to check when one of the vehicle’s lamps is not working? The bulb and the fuse connected to it. The intactness of the lamp’s lens. The functionality of the lights handle. We should take the vehicle to a licensed garage, which is the only place allowed to check tire air pressure. We check the air pressure with a tire pressure gauge. It is enough to just look at the tires. We should take the vehicle to a licensed tire repairman, which is the only one allowed to check tire air pressure. What should a driver do when he detects a safety failure in the steering wheel or brakes while driving? Continue driving carefully until the nearest garage. He should stop driving only if the failure is in the ignition or fuel system. Identify the source of the problem and try to overcome it. How would you conduct yourself in case of brake overheating as a result of continuous braking? Continue driving normally and don’t use the brakes much. Use the parking brake temporarily. Continue driving fast to ventilate the brakes. Stop! Wait for the brakes to cool down and continue driving on very low gear. What are the vehicle’s control systems? What is a vehicle GPS navigation system? A system providing information about vehicle location and assisting the driver to reach his destination. 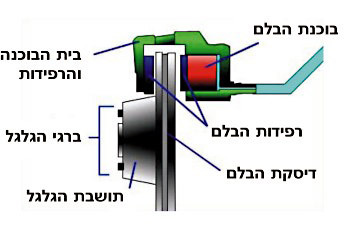 An efficiency enhancement sub-system within the steering system. A system checking the proper function of the vehicle’s computerized systems. A system measuring the vehicle’s fuel consumption. Which vehicle component (part) engages or disengages the rotational movement from the engine to the gear box? Make the driver more alert. Cause self-blinding of the driver. Have no effect on driving and on vehicle control. Do not illuminate the road properly. To prevent excessive use of the vehicle’s brakes. To serve as an additional brake in case of danger. To enable control and steering of the vehicle during braking. Annuls the need for an annual test. Reduce fuel consumption as well as wear and tear of vehicle parts. Is only required if the vehicle is frequently used. In a new model vehicle, maintenance is not required at all. When is it required to check the vehicle’s air polluting emissions? Vehicles cause no pollution; hence there is no need to perform a check. Once a month, in every garage specializing in car electronics only. Once every half a year, at the treating garage. In the vehicle’s annual test at a licensing facility.